Nine separated eggs. I think Kitty is giving me the stink eye in this photo. Not that long ago, I was a bit of a joke in the kitchen. I also burned a lot of food. My roommates were, and still are, lovely women (despite the deserved teasing), and I’m not sure if I’ve ever really told them how influential they all were in my development as a cook, or, better yet, someone who actually cares about food. The thing that really blew my mind, though, was macaroni and cheese FROM SCRATCH. I had NEVER IN MY LIFE heard of mac-n-cheese from scratch. But my roommates sometimes MADE mac-n-cheese WITHOUT a blue box. That’s when I knew they were for serious. “Frosting” on the left, cake batter on the right. I picked up a thing or three from these three fabulous ladies, and when I had kitchen of my own, I dove in and found solace in my food laboratory. I started collecting cookbooks and reading food blogs. And here I am today, with an occasionally foodish blog of my own. This all leads me to the subject, or rather the impetus for the subject, of this post. My mom asked me to bake a cake for her recent birthday dinner. “I just love your baked goods,” she said. Ha! She asked me, the ex-Buegefier of cuisine, to bake her a cake. I’ve come a LONG way. Adapted from The Fanny Farmer Baking BookThis was the first time I made this cake, but not the first time I ate it. Per our birthday tradition, MVH made this cake for me one year. And what makes this cake one-of-a-kind? Hold onto your apron strings: it’s frosted with uncooked batter! Raw eggs ahoy! Consequently, it’s not for everyone. But I can’t say it’s not delicious and moist and kinda naughty-tasting. Nope. No can say. Also: this cookbook is quite good and written with a very friendly voice, with lots of historical tidbits about different desserts and baked goods. It’s one of my favorite cookbooks. My copy doesn’t have pictures, which may be its only major flaw. Prep a 9-inch springform pan with butter and flour or baking spray (my preference). Line the bottom of the pan with parchment paper. Spray or butter/flour the parchment. 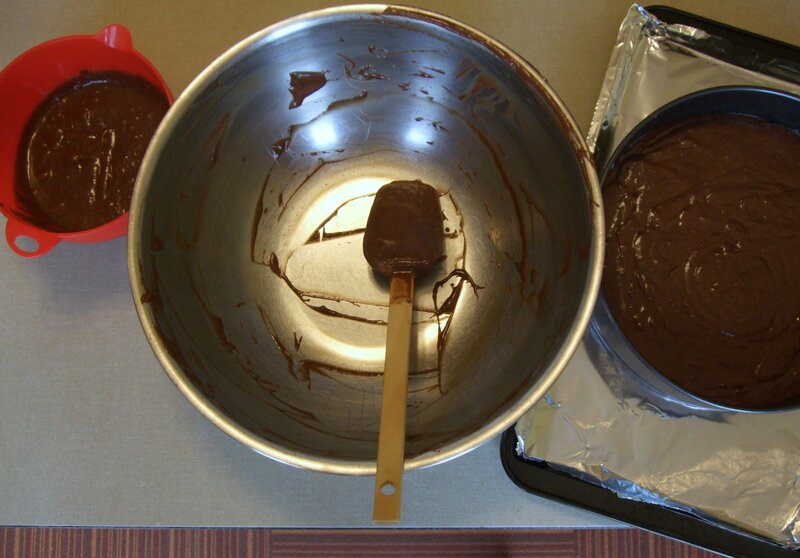 Melt butter and chocolate over low heat, stirring frequently, until smooth. Set aside to cool. 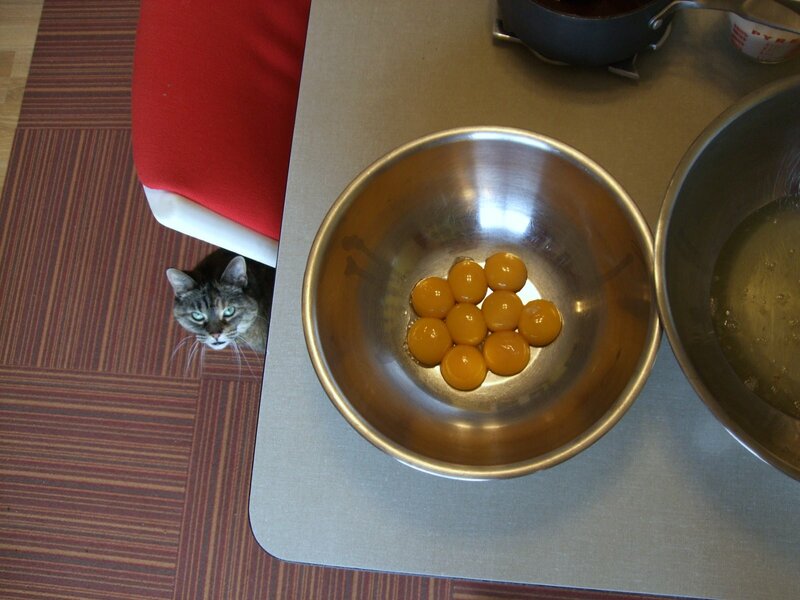 Beat the egg yolks for a minute. Slowly add the sugar, and beat until thick and pale. Add the cooled butter-chocolate mix. Stir until blended. 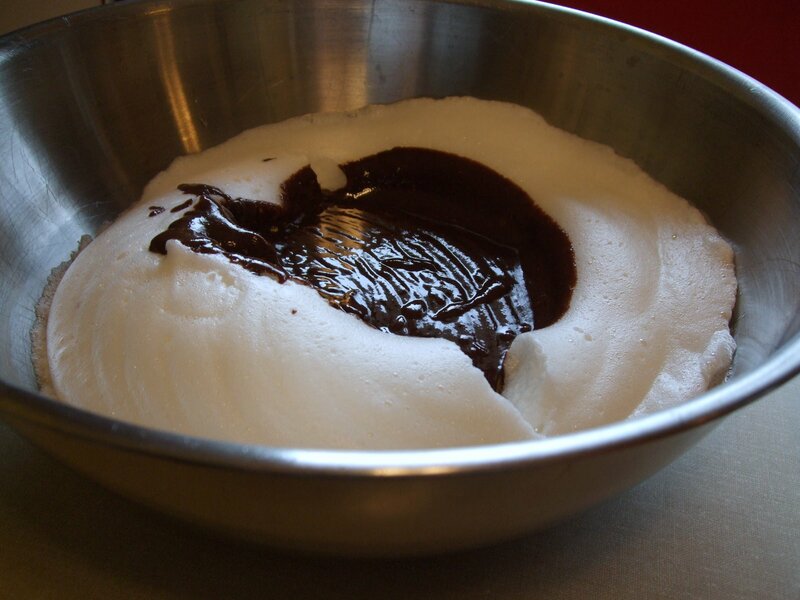 In another bowl, beat egg whites until they are stiff but moist and stand in peaks that droop slightly. Pour the chocolate mix over over the beaten whites. Gently fold together until thoroughly mixed. BE GENTLE and go slow. Remove one-third of the batter and refrigerate it. This is your frosting! Another nut-topped chocolate cake. Can’t hardly go wrong with that. The frosting will make some heavy, lovely drips. Spread the remaining batter into the prepared pan, and put the cake in the oven. Check after 40 minutes. (The original recipe said to bake for 25-30 minutes, but I think my oven is slightly cool, because the total baking time was 47 minutes.) If the cake isn’t finished, check every 3-4 minutes until it’s set. 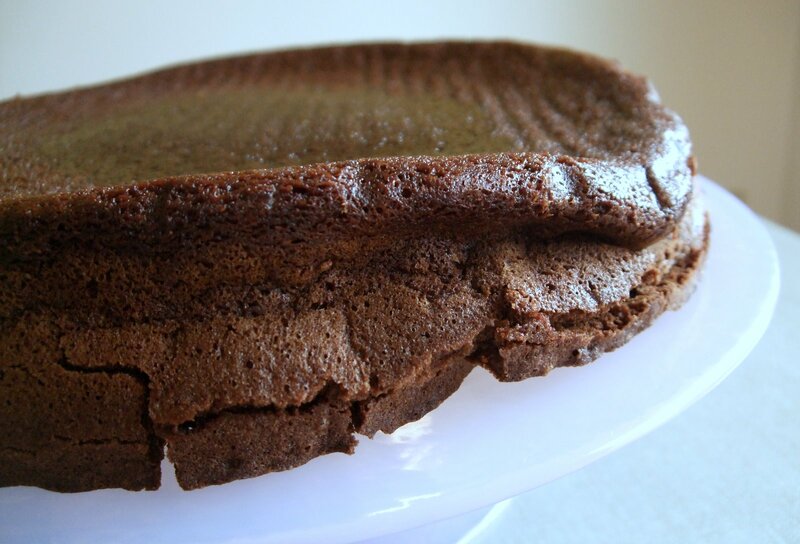 Once it’s done baking, remove the cake from the oven and allow it to cool. It probably will collapse, but that’s OK because you’re going to invert the cake onto a plate or stand. Frost the cake with the reserved batter only after the cake is cooled completely (otherwise the frosting will get warm, thin, and too drippy). 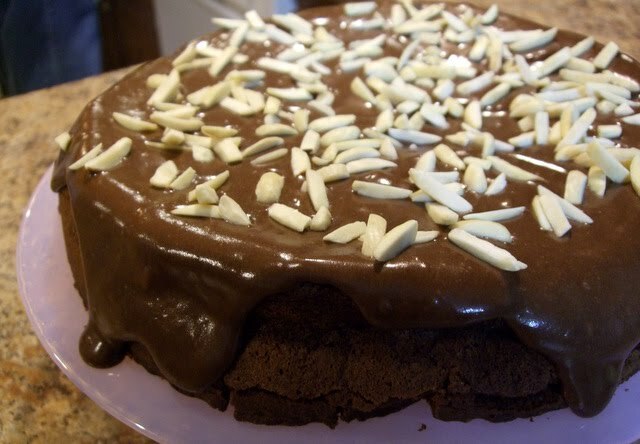 Top the cake with slivered almonds, if you please.